STIX is a short-term trading oscillator that was published in The Polymetric Report. It compares the amount of volume flowing into advancing and declining stocks. STIX usually ranges between +42 and +58. If STIX gets as low as 45, the market is almost always a buy, except in a raging bear market. The market is fairly overbought if STIX rises to 56; and except in a new bull market, it’s wise to sell if STIX should go over 58. Traders and investors should modify these rough rules to suit their own objectives. In normal markets, STIX rarely gets as high as 56 or as low as 45, so rigid use of these rules of thumb would keep you inactive most of the time. For active accounts, the rules might be made much less stringent. 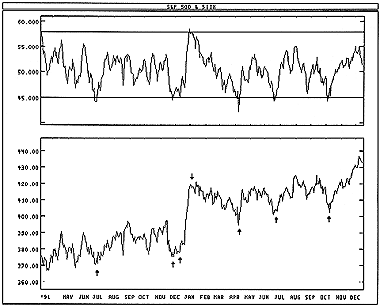 The following chart shows the S&P 500 and the STIX indicator. I drew “buy” arrows when the STIX fell below, and the rose above, the oversold level of 45. I drew “sell” arrows when the STIX rose above, and then fell below, the overbought level of 56.